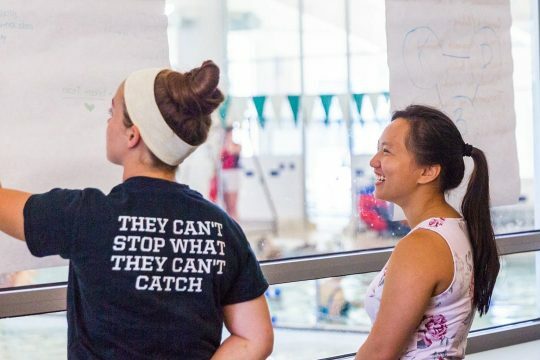 The South Shore YMCA is an award-winning, Authorized Provider of American Red Cross training and certification courses, training more individuals in life-saving water and land skills than any other facility in New England. American Red Cross certifications are recognized nation-wide. Train to become an American Red Cross certified Lifeguard or Instructor, or learn how to respond to emergencies by becoming CPR/AED and First Aid certified. The skills learned in American Red Cross certification training courses could save a life. Courses include hands-on skill sessions and scenarios, videos, group projects and discussions, and eLearning programs where noted. The course provides entry-level lifeguard participants with the knowledge and skills to prevent, recognize and respond to aquatic emergencies and to provide professional-level care for breathing and cardiac emergencies, injuries and sudden illnesses until emergency medical services (EMS) personnel take over. Pre-requisites: minimum 15 years old by the conclusion of the course; photo ID; complete assigned eLearning program by first class; complete pre-requisite skill evaluation prior to first class: 300-yard swim using freestyle and breaststroke; 20-yard swim, submerge to retrieve a 10lb object, return swim on back while holding the object in under 1 minute and 40 seconds; 2 minutes treading water without using hands. The course re-certifies current Red Cross Lifeguarding certificates. Pre-requisites: minimum 15 years old; photo ID; current Red Cross Lifeguarding certificate; pocket mask; complete assigned eLearning program by class date; complete pre-requisite skill evaluation prior to class: 300-yard swim using freestyle and breaststroke; 20-yard swim, submerge to retrieve a 10lb object, return swim on back while holding the object in under 1 minute and 40 seconds; 2 minutes treading water without using hands. The course trains current Lifeguards to guard at waterfront locations such as ponds, beaches and lakes. Pre-requisites: minimum 15 years old; photo ID; current Red Cross Lifeguarding certificate; complete pre-requisite skill evaluation prior to class: 550 yard swim using freestyle and breaststroke; 20 yard swim, submerge to retrieve a 10lb object, return swim on back while holding the object in under 1 minute and 40 seconds; 2 minutes treading water without using hands; retrieve 3 submerged objects, 5 yards apart in 5-7 foot depth. The course trains instructor candidates to teach Red Cross Lifeguarding and related aquatic courses. Pre-requisites: minimum 17 years old; photo ID; current Red Cross Lifeguard certificate; pocket mask; printed Red Cross Lifeguarding Instructor Manual; Red Cross Lifeguarding Course Manual; complete assigned eLearning program prior to class; successfully demonstrate proficiency in Red Cross Lifeguarding program skills at pre-course evaluation session. The course re-certifies former Red Cross and equivalent Lifeguarding Instructors whose certifications are less than 2 years expired. Successful completion will result in a Red Cross Lifeguarding Instructor certification. Pre-requisites: minimum 19 years old; photo ID; pocket mask; current Lifeguarding certificate; proof of previous Lifeguarding Instructor certification; printed Red Cross Lifeguarding Instructor Manual; Red Cross Lifeguarding Course Manual; complete assigned eLearning program prior to class; successfully demonstrate proficiency in Red Cross Lifeguarding program skills at pre-course evaluation session. The course re-certifies current Red Cross Lifeguarding Instructor/Trainer certifications and includes an in-water practice and polish skills sessions with peers as well as a classroom-based review of Red Cross administrative policies and procedures. Pre-requisites: minimum 17 years old; photo ID; pocket mask; current Red Cross Lifeguarding Instructor certification; printed Red Cross Lifeguarding Instructor Manual; successfully complete a final rescue skill scenario/evaluation. The course trains instructor candidates to develop the knowledge and skills to plan and teach courses in the Red Cross Swimming and Water Safety Programs. Pre-requisites: minimum 16 years old; photo ID; printed Red Cross Water Safety Instructor Manual; Red Cross Swimming and Water Safety Manual; complete assigned eLearning program prior to class; successfully demonstrate Red Cross level 4 stroke and skill proficiency at pre-course evaluation session. The course teaches participants ages 10-15 how to safely care for infants through school-age children. Participants will learn how to perform tasks such as diapering, preparing simple meals and dressing. The curriculum includes ideas and tools to create a resume, develop leadership skills and build a babysitting business through safe channels. Participants will discuss safe and age-appropriate games to play with children, and learn how to respond to emergencies. Participants will receive a copy of the Red Cross Babysitter’s Handbook for ongoing reference. The course trains individuals with a duty to respond to breathing, cardiac and first aid emergencies in adults, children and infants until more advanced medical personnel take over. Real-life rescue scenarios reinforce decision-making skills. Pre-requisite: 2 assigned eLearning programs due at class. Looking for Open Pool Hours? Looking for More Swim Programs? Teaching our communities to be safe around water is not a luxury: it is a necessity. Help the Y to ensure water safety for all in our communities.